Libraries are usually among the first to feel budget tightening by school administrators who often aren’t aware of the role libraries play in today’s educational landscape. If school librarians want to make a case for funding, they must demonstrate how they help students learn and prove that they build collaborative instructional partnerships with classroom teachers. 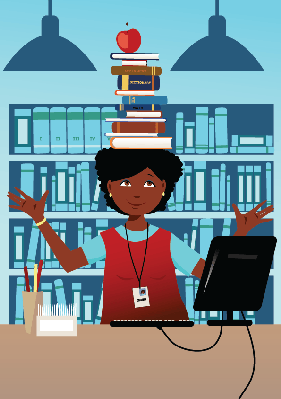 In the October 23 issue of eSchoolNews, Managing Editor Laura Devaney, offers four ways that librarians can advocate for their library. Read the article. At PBS LearningMedia, you and students can find our more about all of the resources your library can offer and how librarians can support young readers and learners at home and in the classroom with Libraries | Reading Rockets: Topics A to Z for grades K-6. Not so fun is an engraving, The Execution of Pere Jean Guigard, of a Librarian of the Jesuit College who was hanged and burned because an old book against the king was found in his cupboard. This entry was posted in PBS Resources, Teaching Tools, Uncategorized. Bookmark the permalink.